Earlier this week, Netflix dropped “My Furry Valentine,” a special double-length Valentine’s Day episode of Big Mouth. The series has had two full seasons prior, and I didn’t much care for them, but I decided it was worth watching the 46-minute special, out of curiosity if nothing else. Let’s have a look. “My Furry Valentine” focuses on the eponymous holiday and how various characters feel about and celebrate it. The special opens with Nick waking up next to Connie, a reminder to the audience that she’s his new hormone monster after the end of season two. Nick is beginning to develop some strange feelings and symptoms and starts to think he may be too sensitive. He can’t help but wonder if having a female hormone monster is at the root of his new problems and begins to take his confusion out on Connie, as well as his parents. Meanwhile, Jessi’s resentment toward her mother’s girlfriend remains bubbling below the surface, and she says she hates Valentine’s Day because it reminds her of how bad her life is. Matthew is similarly forlorn due to being the only out gay guy in the school, but he puts on a better show than Jessi. Andrew makes Missy a valentine encouraging her to make a move on him, but quickly becomes enraged when he sees her with Lars. This leads to disastrous actions on Andrew’s part. Jessi and Matthew decide to go on a platonic non-date for Valentine’s and end up having a great time, with Jessi even apologizing to her mom for how she’s been treating her. Nick blows up at his parents and abandons them at dinner, but makes up with Connie. Matthew meets a potential boyfriend. In the end, Andrew ends up being the worst off, humiliating himself and alienating Missy, who no longer wants anything to do with him. I love animation and tend to seek out a lot of it, but this show’s animation style has always been less than impressive. I don’t like the character designs at all, and it feels extremely simplistic; a lot of adult cartoons do this, but I think it’s lazy and uninspired. However, the music by Mark Rivers is actually pretty good. “My Furry Valentine” is a musical episode, and I liked a couple of the songs, especially Jessi and Matthew’s “Who Needs a Boy When I Got You?” and Connie’s revised version of the show’s theme song. I disliked some of the other numbers, but honestly, this is the first time I’ve liked any of Big Mouth’s songs. A big part of my problem with this show is the comedy and the way it handles some of its heavier subject matter. When it comes to something like Jay being abused by his brothers, or Andrew’s behavior at Lola’s party, I wouldn’t play it comedically. I don’t understand some of the topics and situations Big Mouth finds funny. They try to take the uncomfortable subject of puberty and portray it with honesty and humor, and I can appreciate that goal in concept. But some of these storylines should be handled more seriously. To make matters worse, with exceptions like the Shame Wizard and some of Connie’s dialogue, the comedy just isn’t very funny. It’s juvenile and crass, which is fine with me as long as I’m laughing, but Big Mouth’s jokes more often leave the viewer in awkward silence. The show’s animation and style of comedy are two of its big selling points and distinguish it from other animated sitcoms, yet both come off as clumsy and awkward. 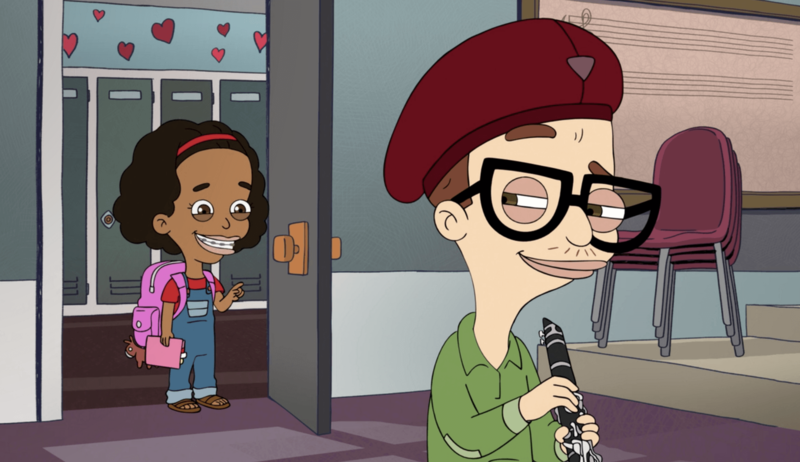 The voice acting in Big Mouth generally varies quite a bit in quality, and “My Furry Valentine” is no exception. Performances from the aforementioned Richard Kind, Nick Kroll, and Maya Rudolph are honestly pretty good. David Thewlis as the Shame Wizard doesn’t make an appearance in “My Furry Valentine,” having been banished near the end of season two, but I honestly hope he comes back at some point. I really enjoyed that character. However, some of the characters have annoying voices, like Lola, Coach Steve, and Maury, and I don’t find it funny or endearing. It’s distracting, and you can just tell that, as Maury, Nick Kroll is trying to sound like Will Arnett and it’s just pitiful. This kind of ties back into the bizarre comedy in the show, and is one case where it doesn’t pay off. Overall, “My Furry Valentine” is an alright holiday special for Big Mouth, which puts it just about on par with the rest of the series. It’s probably my favorite episode of the series yet, for the simple fact that I enjoyed some of the musical numbers and I found myself rolling my eyes less, but that could also be because I knew exactly what to expect. That being said, overall and specifically in the case of “My Furry Valentine,” this show baffles me. There’s a really good idea at the heart of Big Mouth, as well as some talented actors and genuinely interesting drama. However, the comedy, animation, and some of the songs seem bound and determined to undermine any goodwill fostered by the show’s better aspects. I can’t really say that I either like or dislike this show, but I can definitely say that it’s interesting. If you’ve seen either season of Big Mouth, you probably already know if you’ll like “My Furry Valentine.” I’d probably recommend it, and the show in general, if you like animated sitcoms and you’re extremely forgiving. Big Mouth - "My Furry Valentine"
“My Furry Valentine” is an alright holiday special for Big Mouth, which puts it just about on par with the rest of the series. It's probably my favorite episode of the series yet, for the simple fact that I enjoyed some of the musical numbers and I found myself rolling my eyes less, but that could also be because I knew exactly what to expect.